While starting to look around for various F5 topics for study, I was directed to http://veritablenetworks.blogspot.com/2012/11/f5-application-delivery-fundamentals.html. This page has a full listing of research topics for the F5 101 exam, but is a little out of date. I decided to use this as the starting point for my studies, but needed to update several aspects of it to the current exam blueprint and software versions. 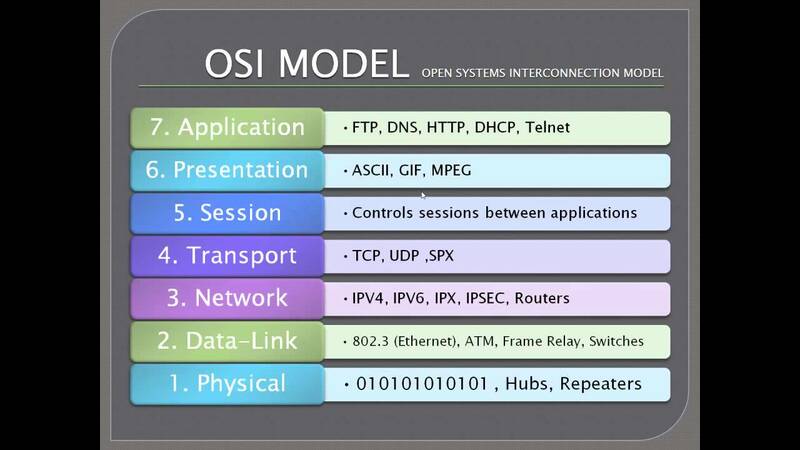 This page will focus on the OSI model - this is likely review for the most part, but its always good to know exactly what they are asking about.. 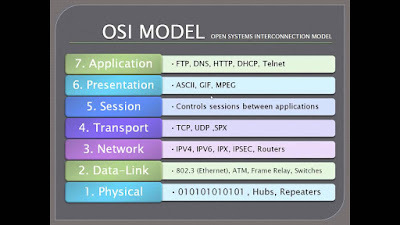 The OSI model is the general model used by most/all network solutions today. This model is composed of 7 layers: each layer has a specific role that sends and receives information to the layers directly above and below. This model allows for each layer to perform specific tasks and functions before passing traffic to the next layer. Physical: The physical layer describes the physical connection between devices, the types of cables or frequencies, voltage levels, adapters, and so on. In essence, the physical layer is all of the physical components (wired and wireless) in a network. Data Link: The data link layer is responsible for 2 things: addressing within the physical network and frame synchronization/error checking. Addressing uses Media Access Control, or MAC addresses - a 12 byte unique identifier that is a mixture of the manufacturer identity and a random number. Network: The network layer is responsible for addressing and routing on larger networks. The network layer is most commonly associated with an IP Address, but is responsible for much more. The network layer also performs packet sequencing, data fragmentation, creation of virtual circuits and more. Transport: The transport layer is responsible for flow control between multiple applications and services. This layer is commonly associated with TCP, and is responsible for confirming reliability of data transmission. Session: The session layer is responsible for creating, maintaining, and terminating conversations on the network. The easiest parallel to describe the session layer would be a telephone switchboard operator - they establish and maintain the connections between the parties, and then take down the connection when the conversation is finished. Presentation: The primary role of the presentation layer is to simply convert the well structured network data into something the application layer can understand, and visa-versa. This is necessary because applications may have many different ways to communicate, and this layer translates the communication methods into a single standard. Application: The application layer is the final layer of integration between the network and applications. Traditionally, addressing occurs only at the Network and Data Link layers. The Data Link layer uses MAC addresses to identify and communicate with nodes over the Physical layer. This addressing method is inefficient as it requires broadcasts to find nodes and perform name resolution. NOTE: This will only allow communication with nodes that are on the same network. Address Resolution Protocol, or ARP, is used to provide translation between Network and Data Link addresses. The data link layer is often referred to as having 2 sublayers - the Media Access Control (MAC) layer, and the Logical Link Control (LLC) layer. The LLC sublayer is responsible for providing enabling several network protocols (IP, IPX, Decnet, etc..) to coexist within a multipoint network and to be transported over the same network medium. It can also provide flow control and automatic repeat request (ARQ) error management mechanisms. A forwarding information base (FIB), also known as a forwarding table or CAM table, is most commonly used in network bridging, routing, and similar functions to find the proper interface to which the input interface should forward a packet. It is a dynamic table that maps MAC addresses to ports. It is the essential mechanism that separates network switches from network hubs. An Ethernet switch's role is to copy Ethernet frames from one port to another. The presence of a CAM table is one attribute that separates a switch from a hub. Without a functional CAM table, all frames received by a network switch would be echoed back out to all other ports, much like an Ethernet hub. A switch should only emit a frame on the port where the destination network device resides (unicast), unless the frame is for all nodes on the switch (broadcast) or multiple nodes (multicast). Generally, the CAM table is a system memory construct used by Ethernet switch logic to map a station's MAC address to the switch port the station is connected to. This allows switches to facilitate communications between connected stations at high speed regardless of how many devices are connected to the switch. The CAM table is consulted to make the frame forwarding decision. Switches learn MAC addresses from the source address of Ethernet frames on the ports, such as Address Resolution Protocol response packets. ARP is used for converting a network address (e.g. an IPv4 address) to a physical address like an Ethernet address (also named a MAC address). ARP has been implemented with many combinations of network and data link layer technologies, like IPv4, Chaosnet, DECnet and Xerox PARC Universal Packet (PUP) using IEEE 802 standards, FDDI, X.25, Frame Relay and Asynchronous Transfer Mode (ATM). IPv4 over IEEE 802.3 and IEEE 802.11 is the most common case. The Address Resolution Protocol is a request and reply protocol that runs encapsulated by the line protocol. [clarification needed] It is communicated within the boundaries of a single network, never routed across internetwork nodes. This property places ARP into the Link Layer of the Internet Protocol Suite, while in the Open Systems Interconnection (OSI) model, it is often described as residing between Layers 2 and 3, being encapsulated by Layer 2 protocols. However, ARP was not developed in the OSI framework. A media access control address (MAC address) is a unique identifier assigned to network interfaces for communications on the physical network segment. MAC addresses are used as a network address for most IEEE 802 network technologies, including Ethernet and WiFi. Logically, MAC addresses are used in the media access control protocol sublayer of the OSI reference model. A network node may have multiple NICs and each NIC must have a unique MAC address. This is as compared to a collision domain, which would be all nodes on the same set inter-connected repeaters, divided by switches and learning bridges. Collision domains are generally smaller than, and contained within, broadcast domains. A virtual LAN (VLAN) is any broadcast domain that is partitioned and isolated in a computer network at the data link layer (OSI layer 2). LAN is an abbreviation of local area network. To subdivide a network into virtual LANs, one configures a network switch or router. Simpler network devices can only partition per physical port (if at all), in which case each VLAN is connected with a dedicated network cable (and VLAN connectivity is limited by the number of hardware ports available). More sophisticated devices can mark packets through tagging, so that a single interconnect (trunk) may be used to transport data for multiple VLANs. Since VLANs share bandwidth, a VLAN trunk might use link aggregation and/or quality of service prioritization to route data efficiently. VLANs allow network administrators to group hosts together even if the hosts are not on the same network switch. This can greatly simplify network design and deployment, because VLAN membership can be configured through software. Without VLANs, grouping hosts according to their resource needs necessitates the labour of relocating nodes and/or rewiring data links. Yhe term link aggregation applies to various methods of combining (aggregating) multiple network connections in parallel in order to increase throughput beyond what a single connection could sustain, and to provide redundancy in case one of the links should fail. The network layer provides the functional and procedural means of transferring variable length data sequences (called datagrams) from one node to another connected to the same network. It translates logical network address into physical machine address. A network is a medium to which many nodes can be connected, on which every node has an address and which permits nodes connected to it to transfer messages to other nodes connected to it by merely providing the content of a message and the address of the destination node and letting the network find the way to deliver ("route") the message to the destination node. In addition to message routing, the network may (or may not) implement message delivery by splitting the message into several fragments, delivering each fragment by a separate route and reassembling the fragments, report delivery errors, etc. Datagram delivery at the network layer is not guaranteed to be reliable. A number of layer-management protocols belong to the network layer. These include routing protocols, multicast group management, network-layer information and error, and network-layer address assignment. The success of TCP/IP as the network protocol of the Internet is largely because of its ability to connect together networks of different sizes and systems of different types. These networks are arbitrarily defined into three main classes (along with a few others) that have predefined sizes, each of which can be divided into smaller subnetworks by system administrators. A subnet mask is used to divide an IP address into two parts. One part identifies the host (computer), the other part identifies the network to which it belongs. The column Network Destination and Netmask together describe the Network id as mentioned earlier. For example, destination 192.168.0.0 and netmask 255.255.255.0 can be written as network id 192.168.0.0/24. The Gateway column contains the same information as the Next hop, i.e. it points to the gateway through which the network can be reached. The Interface indicates what locally available interface is responsible for reaching the gateway. In this example, gateway 192.168.0.1 (the internet router) can be reached through the local network card with address 192.168.0.100. Finally, the Metric indicates the associated cost of using the indicated route. This is useful for determining the efficiency of a certain route from two points in a network. In this example, it is more efficient to communicate with the computer itself through the use of address 127.0.0.1 (called “localhost”) than it would be through 192.168.0.100 (the IP address of the local network card). A routing protocol specifies how routers communicate with each other, disseminating information that enables them to select routes between any two nodes on a computer network. Routing algorithms determine the specific choice of route. Each router has a priori knowledge only of networks attached to it directly. A routing protocol shares this information first among immediate neighbors, and then throughout the network. This way, routers gain knowledge of the topology of the network. Interior gateway protocols type 2, distance-vector routing protocols, such as Routing Information Protocol, RIPv2, IGRP. Exterior gateway protocols are routing protocols used on the Internet for exchanging routing information between Autonomous Systems, such as Border Gateway Protocol (BGP), Path Vector Routing Protocol. In a case where a router receives a protocol data unit (PDU) larger than the next hop's MTU, it has two options if the transport is IPv4: drop the PDU and send an Internet Control Message Protocol (ICMP) message which indicates the condition Packet too Big, or fragment the IP packet and send it over the link with a smaller MTU. If a receiving host receives a fragmented IP packet, it has to reassemble the datagram and pass it to the higher protocol layer. Reassembly is intended to happen in the receiving host but in practice it may be done by an intermediate router, for example, network address translation (NAT) may need to re-assemble fragments in order to translate data streams, description provided in RFC 2993. IP fragmentation can cause excessive retransmissions when fragments encounter packet loss and reliable protocols such as TCP must retransmit all of the fragments in order to recover from the loss of a single fragment. Thus, senders typically use two approaches to decide the size of IP datagrams to send over the network. The first is for the sending host to send an IP datagram of size equal to the MTU of the first hop of the source destination pair. The second is to run the path MTU discovery algorithm, described in RFC 1191, to determine the path MTU between two IP hosts, so that IP fragmentation can be avoided. NOTE: IPv6 hosts are required to determine the optimal Path MTU before sending packets; however, it is guaranteed that any IPv6 packet smaller than or equal to 1280 bytes must be deliverable without the need to use IPv6 fragmentation. The Identification field, and Fragment offset field along with Don't Fragment and More Fragment flags in the IP protocol header are used for fragmentation and reassembly of IP datagrams. Assuming there is no NAT, PAT, or proxies in use, the source and destination IP addresses will not change as a packet traverses a topology. The MAC addresses, however, are changed with every layer 3 device. If the source/destination are within the same broadcast domain, the two systems will communicate directly, without changing of the MAC addresses. However, if they devices are not within the same broadcast domain, a layer 3 device must route between the networks. Using IP addressing, the layer 3 device determines the next hop. The transport layer controls the reliability of a given link through flow control, segmentation/desegmentation, and error control. Some protocols are state- and connection-oriented. This means that the transport layer can keep track of the segments and retransmit those that fail. The transport layer also provides the acknowledgement of the successful data transmission and sends the next data if no errors occurred. The transport layer creates packets out of the message received from the application layer. Packetizing is a process of dividing the long message into smaller messages. The Maximum Transmission Unit (MTU) operates on Layer 3 (Network Layer) and defines how large a packet can be. Any larger that this value, and the packet is fragmented, or split into 2 or more packets. The Maximum Session Size (MSS) operates on Layer 4 (Transport Layer) and is almost always 40 bytes less than the MTU. If the packet is larger than the MSS, the packet is rejected and has to be recreated. Retransmissions occur when the recieving computer alerts the sending computer of corrupt or missing data. This is normally associated with TCP and relies on the guaranteed delivery features such as packet IDs, sequence numbers, and error checking. The reset flag is used to "reset" or abort a connection. As part of the guaranteed delivery in TCP, a checksum is generated with each packet. This checksum is used to validate if the data within the packet is corrupted. In most environments, checksum errors should be very rare. HTTP originally started with version 0.9, who's key identifier was that it consisted solely of the GET method. HTTP 1.0 has been the most popular HTTP implementation to date and is composed of several loosely defined standards. The main drawback of HTTP 1.0 wasn't strictly defined, leaving leeway between how browsers and servers interpreted different commands. HTTP 1.1 came about to improve on 1.0. The schema was well defined and therefore resulted in similarity between vendor solutions. Additionally, new error codes were provided (24 instead of the previous 16), additional authentication methods, and better handling of TCP connections. There are several HTTP request methods: GET, POST, HEAD, PUT, DELETE, OPTIONS, CONNECT. The first two: GET and POST are the most commonly used. The primary difference between the two methods are how they request information. GET requests information by placing variables in the URL, often seen as form.html?name1=value1&name2=value2. The benefit of this method is that it is easy to see the data being transmitted, and the target location can be bookmarked for future reference. The drawback of this method however is the limited length of the URL and difficulty handling non-text data types. POST requests information by submitting data to the server. This has several benefits including keeping the URL clean, restricting bookmarks, allowing for unlimited data size, and even obscuring the data being transmitted. Active and passive FTP refer to how the FTP connections are constructed. FTP uses 2 connections: a command and a data connection. The difference between these two methods is how, and by whom, the data connection is established. For a Passive FTP session, the client also starts by initiating the command connection to port 21 on the server. The server then responds with a port greater than 1024, which the client then uses to initiate the data connection. Because both connections are generated by the client, its position behind a firewall is not a problem. Simple Mail Transfer Protocol (SMTP) is a standard used for transferring email over the internet using TCP port 25. A cookie is a small file (physical or in memory) on a client computer that is sent to a website whenever the user browses that site. This file can contain simple identifiable information such as an ID, or complex information such as credit cards and passwords. Next, your LDNS contacts the root DNS servers requesting the location of the COM DNS servers. Once the addresses for the COM servers have been received, your LDNS then asks the COM DNS servers for the address of the EDGOAD DNS servers. Once the addresses for the EDGOAD servers have been received, your LDNS then asks the EDGOAD DNS servers for the address of the BLOG servers. A URL is used to specify the location of a resource on a network, and the method of retrieving it. A URL is composed of the following 5 items.